Let's just take one example. In 1 Samuel 15 we read that Samuel tells Saul to go and attack Amalek. Now, who was Amalek? You can go back and look at Moses and when the children of Israel were wandering in the wilderness they were actually attacked by who? Amalek and the Amalekites, or Malekites depending on how you pronounce it. It was really the first terrorist organization we run into in history. Eventually there is a battle that takes place. Do you remember the battle where Moses' hand is raised? What happens? The Israelites begin to actually prevail. But, eventually he gets tired of holding up his hand and as his hand drops and then the Amalekites begin to prevail. So, Moses' aids try to hold his hand up, but they never really finished the battle. By Saul's time Israel is now strong enough to finish this and Samuel on behalf of God says, "Saul, finish them off." What I think is intriguing is that in the next verse Samuel goes on to say, "But save the Kenites because they have been good to you." That particular group would be located in the Jordanian area today. They were good to the Israelites, so they will be saved. There's no collateral damage. Here we have a direct and specific command to take out the Amalekites, but it's so direct and specific that they are not to affect any other groups around there. It was given in the Old Testament in Old Testament theocracy, and again it was a specific command for a specific time against this one particular group of terrorist-like people. So, what about the Koran's call to destroy all who are non-Muslim, or at least reduce them to fined second class citizens? With the Koran such a command is universally binding for all individuals at all times. Osama Bin Laden before he was deep sixed (literally) actually in his fatwa's quoted from Surah 9:29. His second Zarqawi quotes from this verse and the many other verses that for Islam justify their jihad. Can you think of any Christian leader today saying, "Go out and kill the Amalekites?" First of all, there aren't any. And, second of all, it's never ever used. 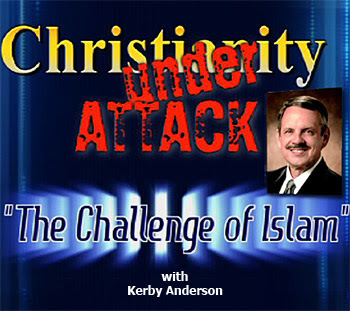 What makes God's command to destroy the Amalekites so very different than the Koran's call to destroy all non-Muslims is because in the Old Testament it's a direct and specific command given in a theocracy towards a very specific group of individuals. Take for example Surah 47 which reads, "When you meet unbelievers smite their necks, and then when you have made wide slaughter among them tie fast the bonds then set them free. Either by grace or ransom 'til the war lays down its loads. And those who are slain in the way of God, he will not send their works astray. He will guide them and dispose their minds alright and he will admit them to Paradise that he has made known to them." This is an obvious argument for jihad, but those who are slain in this holy jihad, what happens to them? They go to what? Paradise. Elsewhere we're told they will receive seventy virgins supposedly. Boy, are a lot of people who have engaged as martyrs for Allah in for a great surprise, aren't they? More importantly, we see that Surah 47 has become a very compelling argument used for the Martyr's Brigade and other radical Islamic groups. It also illustrates again the tremendous threat that we in the West face just militarily with an adversary who actually wants to die in battle. 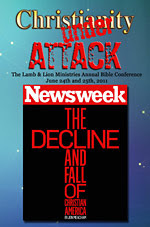 "Like Bible prophecy? Like hip hop? Can these two even be merged?!? Yes..."
I love the idea nathan!! My 17 yr old would actually LISTEN to it!! Hahaha... if i can do anything to contribute music to take his mind away from lil wayne and ONTO Christ, i would be thrilled. And its been my recent experience that with the world in the condition its in politically, prophecy is easy to introduce to our young people. Hey yeah...turn to Word into gangsta rap...have a tattoo and body piercing booth while you're at it...that outta appeal to the younger crowd! I meant... lost in a unique fashion..
As a parent .. i can tell u... the only thing demonic about the music is the words. Rev 7:9...After this I looked, and there before me was a great multitude that no one could count, from every nation, tribe, people and language, standing before the throne and before the Lamb. They were wearing white robes and were holding palm branches in their hands. Anon, i think most people do freaky stupid things BEFORE they get saved for the most part. But people who r lost in any corrupt culture need Jesus just like we do. So i think its not only commendable to relate the gospel on their level.... but CRUCIAL!!!!! For instance, the drunks on skid row need someone to relate the gospel on their level..... where they r.... but it doesnt mean u drink a carafe of md2020 with them while ur there. Anon, o my gosh... ur last thought kinda sounds like u r comparing the outword appearance of a believer in Christ to that of a nazi. I sincerely hope our Lord doesnt feel the same way. Personally i dont think he is concerned about that. He just wants us to commit ourselves to him. Rodney, ur comments are encouraging.... and were u able to get a password last nite? I see what u r saying anon, and i dont disagree with u totally ... i no whats right and what isnt.... but i have learned over the years to be patient and trust the One who knows the end from the beginning. :) and i am not dr reagan and dont always agree with him altho i have tremendous respect for him and love this ministry. These guys are actually going out into the world where the people are the most needy and sharing the live-changing message of Jesus with them. They're following the Lord's example of "eating with sinners." They're the real deal - tattoos, clothes and all. And, the Lord loves them for their heart and obedience to Him. ...call a black person the n word? Thank you...you said in one paragraph what I was trying to say all along (but did a horrible job in doing so). nathan said "They're the real deal - tattoos, clothes and all." Dr. Reagan...are you listening to this?